Chichen Itza was one of the most prominent Mayan cities in the Terminal Classic and Postclassic period. The city was home to one of the most diverse populations of any Mayan city, which is reflected in the presence of many different architectural styles in the Chichen Itza constructions. By the 9th century, the city became a very powerful political and economic power in north and central Yucatan. Although the city’s decline as a major power began in the 12th century, it still hadn’t been abandoned by the time of the Spanish conquest in the 16th century. Chichen Itza became a significant Mayan city in the Late Classic period between 600 and 900 A.D. At the end of the Classic period, many powerful Mayan cities in the southern regions had collapsed. Chichen Itza was located in the Northern Maya lowlands and not only survived the collapse faced by other Mayan cities but steadily progressed and reached its peak in the 10th century. It was also at the beginning of the 10th century that the grand layout of the city was developed. Chichen Itza was one of the most prominent Mayan cities in the Terminal Classic and Postclassic period. The site of Chichen Itza housed some of the most iconic Mayan architecture. The city had a diverse and densely clustered architecture which drew influence from multiple cultures. The modern-day ruins of Chichen Itza has most of these constructions intact. The ruins of the city today include some of the best architecture that was constructed by the Mayans in Chichen Itza in the heyday of the city. These include the El Castillo step pyramid, a great ball court, a skull platform, a huge temple of the warriors, the Osario pyramid, the Temple of Xtoloc among others. Chichen Itza began to develop into a thriving Mayan centre by the 7th century. At this stage, early constructions at the city happened. It continued to develop through the 8th and 9th centuries and during the 9th century, the first phase of the construction of monumental buildings in Chichen Itza took place. It was also the period during which the city rose as a powerful economic and political capital of the region and the population rose significantly. The second phase of monumental buildings in Chichen Itza was from the 11th century to the 13th century. By the 13th century, the power of Chichen Itza had declined and Mayapan replaced it as the regional Mayan power. The city of Chichen Itza was located in the northern Maya lowlands, which were located in the modern day Yucatan region in Mexico. Water was a precious resource in the agriculture-based Mayan society and the city of Chichen Itza was located, and founded, by a cenote, or a large natural well of water, which also gave the city the first half of its name. Chichen Itza was already a major Mayan city by the end of the Early Classic Period. Between 600 and 900, the city steadily rose in prominence and prestige so much so that by the end of the Late Classic period, it was already the most powerful Mayan city in the region and commanded the alliance and tribute of many other Mayan cities. It was during the rise of Chichen Itza in the Classical Period that many of its iconic monuments were constructed, though not all of them. 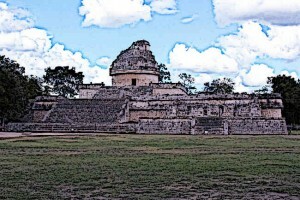 The influence of the city extended to the social, economic, political and cultural life of the northern Maya lowlands. The architecture of the city of Chichen Itza features the most amazing and diverse constructions of all Mayan cities. This may partially have been a result of the fact that the city hosted diverse populations and admitted influence from diverse cultures. Consequently, architecture in Chichen Itza has features from different construction styles. Most of the city’s significant constructions were clustered at its core area and included stone buildings. Similarities to Puuc style architecture is quite prominent in early Chichen Itza structures although block masonry walls differentiates them from typical Puuc constructions. Some building also feature Chenes-style architecture. El Castillo, or the Castillo pyramid, is probably the most famous Chichen Itza building. It’s a 98-feet high step pyramid which has a structure so that it casts a serpent-like shadow on spring and autumn equinoxes. Another notable building of the city is the “Temple of the Warriors” with its “Group of a Thousand columns.” The temple is a huge stepped pyramid with a multitude of columns in front of it which have been carved to depict warriors. El Caracol is a building with a spiral staircase which is estimated by archaeologists to have been an observatory for the celestial movements. In the 13th century, the rival Mayan city of Mayapan had ascended in power and influence and effectively replaced Chichen Itza. There is evidence of the sacking of the city sometime after the 12th century and some Maya traditions claim that the city was conquered by the ruler of Mayapan, Hunac Ceel. However, this latter tradition seems anachronous to historical evidence. While the causes of Chichen Itza’s decline are not clearly known, what is known for certain is that the city had lost its political dominance in the region by the end of the 13th century. However, it was not abandoned by the population until the time of the Spanish conquest. The city of Chichen Itza rose to prominence at a time when the southern Mayan cities ran into rapid and sudden decline. Being located in the northern region, Chichen Itza gained immense power and influence by the time of the Late Classic period and was the most important Mayan city in the region. In two phases, extraordinary architectures were built in Chichen Itza, many of which stand to this day. By the 12th century, the city’s influence had begun to wane and by 13th century, Chichen Itza lost its influential position in the region to the city of Mayapan.